The fire shrimp (Lysmata debelius) is a colorful marine shrimp from the Indo-Pacific that makes a great addition to almost any saltwater aquarium. They belong to the family Hippolytidae. 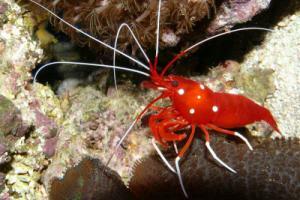 Fire shrimp are vividly colored, with bright red bodies that have small white circles on their carapace. The lower portions of their legs are white, as are portions of their antennae. The fire shrimp is a cleaner shrimp. What this means is that in its natural habitat the fire shrimp provides a "cleaning service" for reef fish by eating the parasites off of them. There are other cleaner shrimp (e.g., Lysmata Amboinensis) and also a few reef fish, such as cleaning gobies and cleaner wrasses, that also eat the parasites off of fish. Reef fish come to depend on the services of cleaner shrimp and cleaner fish, because they have no other way of removing external parasites from themselves. Fire shrimp and other cleaner shrimp and fish will even eat the marine ich parasites off of your fish. Unfortunately fire shrimp are less likely to exhibit this cleaning behavior in captivity than are other species of cleaner shrimp, such as Lysmata Amboinensis. Fire shrimp are more likely to scavenge the bottom of the tank and live rock for their meals, however, they do sometimes "clean" parasites from fish. Fire shrimp are shy animals and need lots of hiding places. You can generally create caves and crevices for them to hide in by arranging the rockwork in a particular manner. See the You Tube video below of a fire shrimp in an aquarium for an example of its general behavior and its tendency to hide among caves made from the rockwork. You can keep a small group of fire shrimp in your tank. Just make sure that there are plenty of hiding spots and your tank is large enough so that they have enough room. Don't keep fire shrimp with large or predatory fish species. Fire shrimp are easy to feed. They will eat almost all marine aquarium fare, including freeze-dried and flakes. They are carnivorous and so feed them meaty foods. Fire shrimp won't harm your reef. As with all invertebrates, they are intolerant of a lot of fish medications. You absolutely cannot use copper based medications in their tank. They are pretty hardy, but take care when acclimating them to your aquarium as they don't tolerate changes well. Fire shrimp grow by molting. Supplemental iodine is reported to be helpful with this process. You don't have to worry about sexing fire shrimp because they are hermaphrodites. If you have two fire shrimp in your tank then you have a pair! If your fire shrimp do successfully mate feed the newly hatched fire shrimp live baby brine shrimp and microalgae. Fire shrimp can usually be purchased for approximately $30 each. Copyright © 2008-2019 AboutFishOnline.com. All rights reserved. Image of fire shrimp by Haplochromis from Wikimedia Commons and published under the GNU Free Documentation license.